Presenting the stylish and the svelte 8 inch hoverboard... 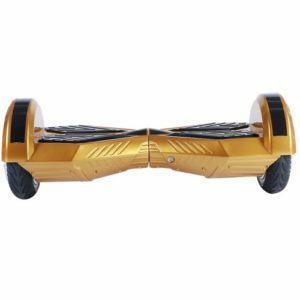 The Lamborghini styled hoverboards are available in colors like white, back, purple, red, graffiti color, blue and gold. The uber cool 8 inch hoverboards offer value for money while upping your style quotient several notches. Soon you’ll befriend this trendy gizmo and will make it your preferred mode of transport as it swiftly travels up to 20 kilometers in one go! The 8 inch hoverboards have a wider base than the 6.5 inch ones, making it perfect for both kids and adults as well. The hoverboards come with a free carry bag perfect for packing away the hoverboard when not in use. The 8 inch hoverboard works smoothly on concrete surfaces as the wheels have a grip like iron, keeping you firmly in balance during all the maneuvers you concoct on it. The base of the hoverboard is ridged and this creates a good adhesion point with the base of your footwear. There is absolutely no chance of you slipping off with the level of safety that we have. You can practice your favorite moves with the 8-inch hoverboard and can reach speeds of up to 15kmph on a single charge of 2-3 hours on the lithium-ion batteries. The fast processing chipset on board ensures that your every command is relayed faithfully. You can move forward, turn and reverse on the hoverboard with the minimum amount of tactile feedback. Be warned that you will be the object of jealousy when you are on your 8 inches Lamborghini styled hoverboard. Heads will turn and jaws will drop as you sashay past envious bystanders. With Australia Hoverboards, take your pick from our superhot collection and hit the road like a rockstar!